The animation represents the principle of additive color mixing. The colored circles can be freely moved within the animation. The intersecting areas represent the result of the mix. The animation shows three color circles, which can be interactively repositioned. Initially the color circles show the three primary colors: red, green and blue. The color values of each color circle can be changed. As a result, any number of color mixtures can be obtained. In the beginning an accumulative color generator mode is used. In this case, the background of the animation appears black. The mode can be changed using the navigation area on the right. 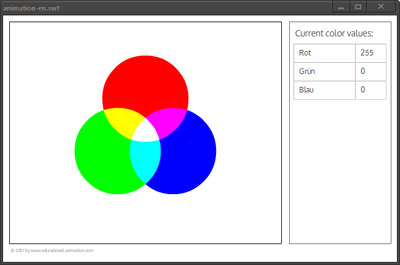 To individually set the color values of a circle, click on the colored circle. Then modify the color values in the table. Alternatively, you can also use the Color Picker to set the color values.